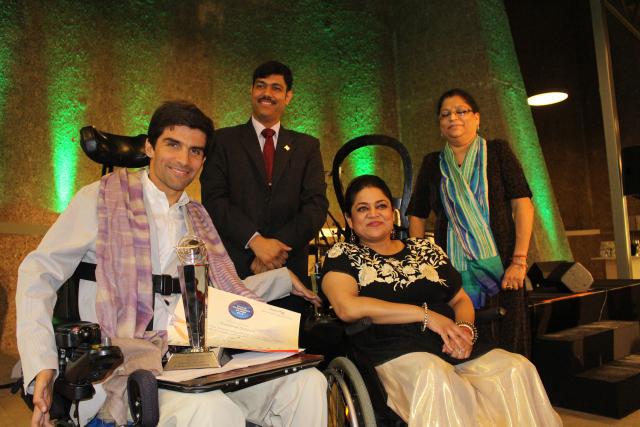 Svayam Accessibility Awards were instituted on 25 October 2010 to promote and recognize the concept of Accessibility & Universal Design in all spheres of our lives to make way for livable communities – in both rural & urban scapes. The awards are conferred on the organizations in the TRANSED hosting nation, that have shown consistent commitment towards providing accessible infrastructure for all. These awards play a pivotal role in providing the right impetus to the development of inclusive infrastructure, related policies & practices so that such initiatives are sustainable and meaningful. 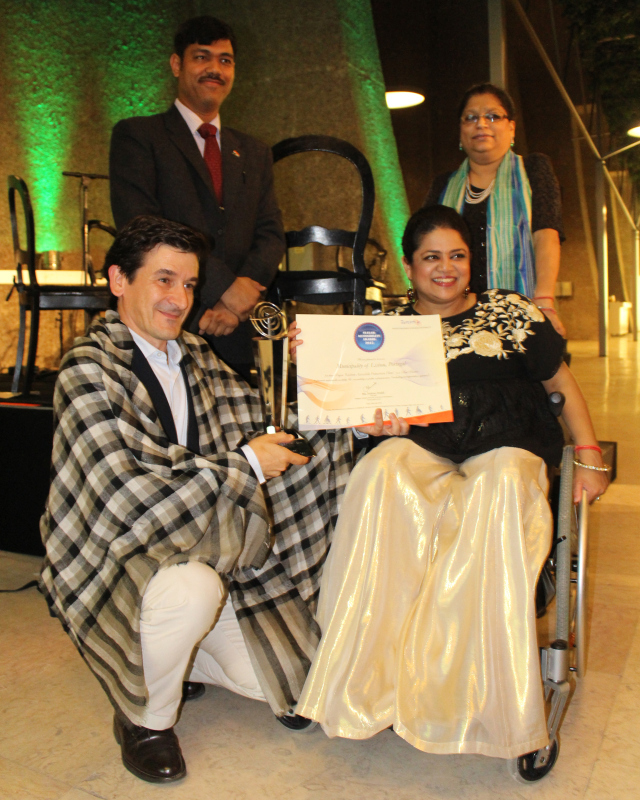 Svayam Accessibility Awards 2015 ceremony were held on 30 July 2015 at Lisbon, Portugal on the sidelines of 14th International Conference on Mobility & Transportation for the Elderly and Disabled Persons (TRANSED Conference, 2015). 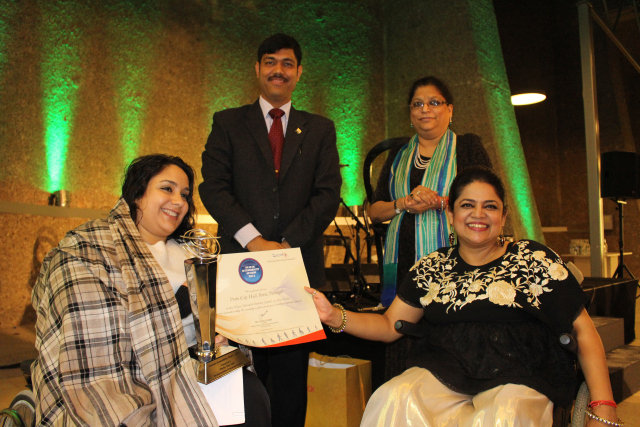 The Awards were given away by Ms. Sminu Jindal, Founder – Svayam during the official Gala Dinner ceremony of TRANSED 2015. 1. Porto City Hall, Portugal - Best Practice by a Municipality for their Project ‘Accessible Itinerary System (SIA)’ . The award was received by Arch. Ms. Lia Ferreira, Ombudswoman of Porto Municipality. Porto City Hall, through its Municipal Ombudsman for Citizens with Disabilities, successfully implemented this ‘Best Practice’ project titled ‘Accessible Itineraries System (SIA) Porto’ – portal that comes to help all the citizens, specially the ones with reduced mobility, optimizing itineraries that meet their needs. The project maps the city, identifies the barriers to seamless & accessible mobility on city routes and addresses them with active citizen’s participation. In short, the project allows online consultation of optimized routes for accessibility (through map consultation), digitally calculated between two previously chosen points giving information not only about paths but also intermodal transportation connectivity, accessibility of important public buildings & spaces. The project has been implemented with active partners like Associação de Surdos do Porto (ASP), Associação de Cegos e Amblíopes do Porto (ACAPO), Associação do Porto de Paralisia Cerebral (APPC) and Associação dos Deficientes das Forças Armadas (ADFA), plus Porto’s Metro and FEUP (Porto’s Engineering University). 2. Municipality of Lisbon, Portugal - Best Practice by a Municipality for their Project ‘Lisbon Accessible Pedestrian Plan’ . The award was received by Mr. João Afonso, Deputy Mayor for Social Rights, Lisbon Municipality. Municipality of Lisbon implemented the ‘Best Practice’ Project – titled ‘Pedestrian Accessibility Plan’ after its approval by the City’s Assembly, in February 2014, and is expected to be completed in 2017. The project follows a participatory approach throughout the Plan’s implementation, in the development and dissemination of data and tools, definition of priorities, and uptake of guidelines and solutions. A key goal for the Plan is to change the way the City administration works. Therefore, while the majority of plan’s actions are being executed by several city departments, a special task force ‘The Pedestrian Accessibility Plan Team’ has been formed which is responsible for coordination, monitoring, technical support and a few very specialized actions. Mr. Pedro Homem de Gouveia, Architect is coordinator of Pedestrian Accessibility Plan Team. 3. Association Salvador, Lisbon, Portugal - Best Practice by an NGO for promoting inclusive tourism through their website http://www.portugalacessivel.com. The award was being received by Mr. Salvador Mendes de Almeida, the Founder of Association Salvador.